Shasta is a pretty big name in soda (at least out in the West), so it makes sense that i would have to review Shasta Root Beer. The company was founded in Shasta Springs, CA, about 4 hours north of San Francisco in 1889, so it has been around awhile. The company makes such outrageous claims as being the first company to sell soda in metal cans and that they created diet soda. They also introduced the 3-liter bottle of soda and have a variety of flavors to choose from. They even have 9 "Hispanic" flavors to choose from. Yes, Shasta is truly international. I have had Shasta sodas for years since they are fairly low priced and have some decent flavors to choose from. This being the case, i have had this root beer multiple times, but i have never had the opportunity to review it until now. I opted for the 2-liter bottle instead of the 3-liter. It is also available in cans, but the 2-liter was cheaper and i didn't want to commit myself to a full 6-pack of this stuff. I try to shy away from reviewing canned soda, but i think the day will come when that's the option i will need to take. Anyway, every Shasta label is decorated the same way with the logo and the bubbles, the only difference being the color of the label (brown for root beer) and the name of the flavor. It's nothing special and it's reproducible, which probably appeals to this soda juggernaut. Not much else to it though. Like i said, i have had this root beer multiple times, but when it came time to review it i didn't really have an opinion. This is because it left no lasting impression. Upon learning about my root beer reviewing endeavors, my lovely wife's cousin Scott told me that Shasta root beer is bad. I hadn't really thought in the past that the root beer was particularly bad, just not memorable. But when i tried it again for the first time as an official, expert reviewer, i had to agree with Scott. This stuff is bad. It's not heinously terrible, but it's not good. It basically just tastes like pure sugar with the slightest touch of vanilla for the first few seconds, but that fades very quickly and then it just has a kind of metallic water taste to it. It's very unimpressive. It was almost disappointing. What happened Shasta? I don't remember you being such a let down. It has a decent root beer scent to it so i had high hopes, but it doesn't really taste like root beer at all. It just tastes like failure and a broken childhood. My official review is that Shasta gets 3 (three) IBCs. I don't gag when i drink it, but it won't be gracing my palate again any time soon. Kind of a big let down. I just never remembered it being so unimpressive. The low price may draw you in, but i would recommend you springing for something a little more expensive and a lot more flavorful. Well... this is it. I have finally come to the point where i have tried every root beer that the Pop Shop has available. Granted they get different ones from time to time, so i plan to swing by now and then to see if they have anything new, but i need to find new sources of root beer. But not before i write the review for this last root beer that i found at the Pop Shop. Kutztown Root Beer is bottled in Kutztown, PA and has been around since 1851. For starters, i don't know why on Earth you would name a city Kutztown, but that's beside the point. 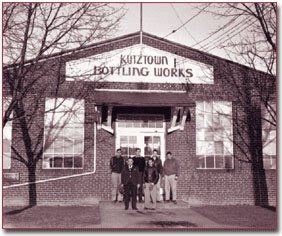 Anyway, the owners of Kutztown Bottling Co. thought it was good enough to name their company after it. Whatever. Since they've been around such a long time, they have a lot of history, and apparently the company has traded hands several times throughout the years. I don't really want to go into it, but if you really care to find out the details you can visit their website and read all about it. There is also a little movie you can watch on their website if you have QuickTime installed, but i'll just go ahead and say don't bother. "When you're bad for something mighty good, reach for a foamy mug of Kutztown Root Beer! Tastes chust like old-fashioned, 'cause you know we make it that way. Drink 'til you ouch, there's more back!" What just happened? Is this for real? Is it some sort of inside joke and i'm just not in the know? Or is Pennsylvania just really short on English teachers? Well whatever it is, i think trying to hold a conversation with one of these people might prove difficult. As far as taste goes, i'll just say it's better than their grammar and spelling, but that's not saying much. But it's ok. I didn't hate it at all. It kinda has an aspertame taste to it, but it says it is made with pure cane sugar. Other than that, it tastes like a regular root beer with a bit of a carmel finish to it. It wasn't very carbonated either. So it wasn't one of my favorites, but i didn't hate it all together. My official review is that Kutztown gets 4 (four) IBCs. I didn't think it was even really good enough to be considered "middle of the road", or in German, "der gemäßigten Mitte". In the end, i wasn't very impressed with it, although i have heard from a personal associate that he quite enjoyed it. I can go without, but if you'd like to pick one up, go for it.